Chances are you have heard that whole grains are good for the body. You probably think they are preferred over refined or processed grains because of the fiber, right? It turns out that it is more than just the dietary fiber that makes whole grains so healthy for the human body. But more about that later. Fiber is the carbohydrate in grains that is not digested nor absorbed. Research has shown that one of the benefits of fiber is that it may lower cancer risk by diluting potential carcinogens (cancer-causing agents) and promoting growth of healthy digestive bacteria (1). Fiber comes mainly from the bran, the outer layer of the grain. There are two main types of dietary fiber: soluble and insoluble. Soluble fiber forms a gel when mixed with liquid, which helps lower blood sugar and cholesterol. Oats and barley are rich in soluble fiber. Insoluble fiber increases the bulk and weight of stool, diluting harmful substances and speeding stool elimination from the body (2). Whole wheat is a prime example of a grain that is high in insoluble fiber. In addition to the fiber, whole grains have hidden benefits that deserve our attention. In particular, whole grains are a source of important minerals and antioxidants. Research has shown that many of these vitamins, minerals and phytochemicals also help our bodies fight cancer. It is thought that a synergy of compounds work together to fight the oxidative free radicals associated with cancer growth. Manganese, for example, is a mineral found in whole grains that helps us handle oxidative stress. Selenium, a trace mineral also found in whole grains, helps the body prevent cell damage and is important for a healthy immune system. Then there’s the powerful antioxidant, Vitamin E (1). Eating a variety of whole grains is the best way to get the broadest range of these powerful nutrients and antioxidants. Whole wheat is rich in vitamin E. Other whole grains that contain powerful antioxidants include buckwheat, kamut, oats, and quinoa. Buckwheat has high levels of the antioxidant rutin, which improves circulation and may prevents clogged arteries. Kamut, an ancient form of wheat, has an especially high protein and vitamin E content. Oats, meanwhile, have avenanthramides, a substance that helps protect the blood vessels from the bad LDL cholesterol. And quinoa has all of the essential amino acids, making it a complete protein source. Additionally, brown, red or black rice is an excellent source of selenium (3). Have oatmeal or bran cereal for breakfast. Choose whole grain bread products. Look for whole grains on the ingredient list, and try to get at least 3 grams dietary fiber per serving. There are wonderful whole grain bagels, buns, English muffins, pita pockets and flatbreads in the grocery. Substitute half the white flour with whole wheat flour in baking recipes. Replace 1/3 of the flour with oats in recipes. Add barley, brown or wild rice to a favorite soup recipe. Choose corn or corn/whole wheat blend tortillas. Have quinoa, bulgur or wild rice as a side dish for variety. Use the leftover grains in salads. Add wheat bran or uncooked oats to yogurt for a little crunch. 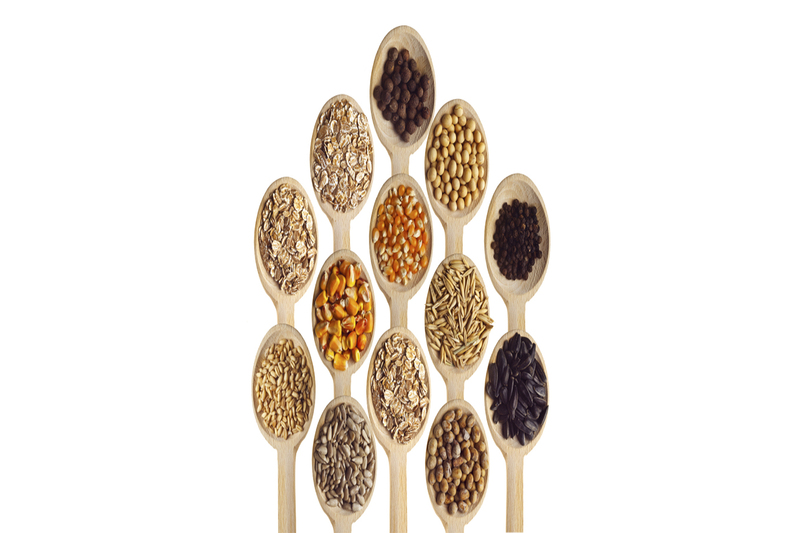 What is your favorite strategy for increasing whole grains? Colorado who specializes in diabetes prevention and health enhancement. Diabetes Diary: How Do You Count Your Carbs? Good Food Sources of Fiber: Not What You Might Expect! Have Irritable Bowel Syndrome? Learn about FODMAPs!